Entwine Jewelry - "Grape Cluster Bracelet"
This piece will be available for purchase at the Pullman Regional Hospital Fundraising Gala on May 2, 2009. This sterling silver linked bracelet features hand crocheted purple clusters of beads entwined in fine silver wire. 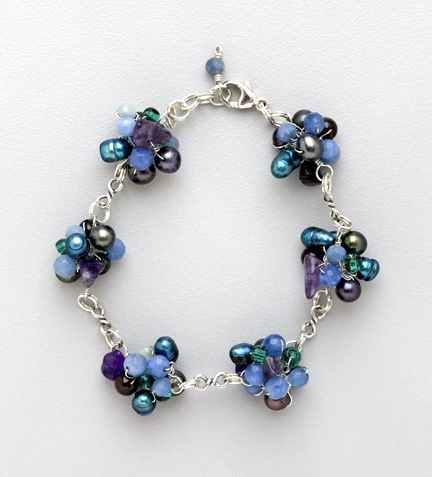 Each cluster of beads includes amethyst chips, purple and teal colored freshwater pearls, cornflower blue quartz, round teal glass beads, and round garnet. It is finished with a sterling silver lobster clasp with an adjustable length.